Catholic sisters are feeling the power of silence, and on July 29 they’ll join hundreds of other Clevelanders to use their quiet for good. 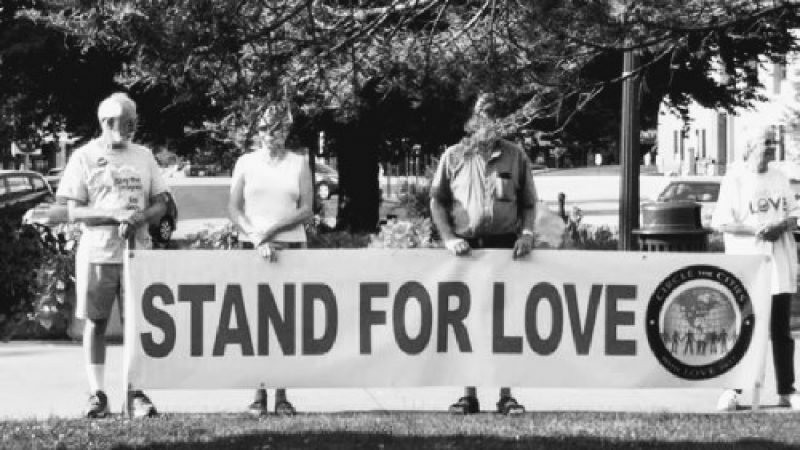 Circle the Cities with Love started in 2016, when Sister Rita Petruziello, CSJ, learned that groups were planning protests and divisive rallies during the Republican National Convention in Cleveland. On July 16, just before the start of the convention, more than 3,000 individuals came together on the Lorain Carnegie Bridge, where they held hands and stood in silence for 30 minutes. The event garnered media attention from across the country, and an international Circle the Cities with Love event was held in January 2017. Sister Rita hopes to have a similar influence this year. This year, Sister Rita partnered with the YWCA of Greater Cleveland, along with the Sisters of Charity of St. Augustine and congregations of Catholic sisters across Northeast Ohio to coordinate the event, which will be held in Voinovich Bicentennial Park in downtown Cleveland. Kickoff is at 2:00 p.m. with music, dancing and a chance to meet one another. Sister Rita and event chair Karen Komondor, director of organizational development at St. Vincent Charity Medical Center, will offer opening remarks and welcome participants. Cleveland police and staff from St. Vincent Charity Medical Center will be in attendance to offer support. All are welcome.